Job seekers should review sample thank you letters before sending interview thank you letters. Writing an interview thank you letter shows common courtesy as well as expressing interest in getting the job. Job interview thank letters can be formal or informal and represent thoughtfulness that interviewers and employers like. There are very few job applicants that write and send a job interview thank you letter. Those that do will be someone that the employer will definitely remember! Studies show that employers view applicants negatively who do not respond with a prompt interview follow up. When writing a follow up job interview letter, job seekers should send the letters within a day of the job interview. The letter should focus on what the employer requires in the position. The thank you letter after an interview doe not need to be wordy or long. Several kind and sincere words will impress the employer. The simple gesture of an interview thank you can cause the employer to choose you for the job! If the job interview was with several individuals then different job thank you letters after an interview should be sent to each one. The interviewing person may have held job interviews with many applicants. Make your job interview thank you correspondence stand out in the crowd. Do not use common or generic job interview thank you letters. Use your imagination to create sample thank you letters for the interview follow up. Word it in a way that highlights why you and your qualifications fit the needs of the employer. Here are the commonly accepted guidelines concerning a thanks for the interview letter. Remember to keep the thank you for job interview letter short sweet and to the point. The interviewer is probably very busy. The thank you letter for a job interview should not take more than a couple of minutes to read. Don’t forget to proofread, check for correct spellings and grammar. This is where you thank the interviewer for the opportunity of meeting with them for the position. Make sure you spell the interviewer’s name correctly. Mention the position applied for and the date of the interview. You can also make favorable comments about the company. Restate your interest in getting the job and give extra information about yourself. Also, highlight your skills and qualifications that fit the requirements of the job. Remember to spotlight the things that the interviewer considered most important. Keep this paragraph short, no more than five sentences. Thank the interviewer for her time and attention. Communicate your expectation of the interviewer calling soon. Let the recruiter know your willingness to come in for further discussion or second interview. You may want to mention that you will follow up with a call in several days. Add your contact info with the best time and way to reach you. Another important tip when writing interview thank you letters is to use good quality paper. I appreciate the time and attention you took to meet with concerning the Inventory Specialist position. The information you shared fits well with my experience, training and skill. I am extremely enthusiastic about the opportunity. I was excited to learn that ABC Corporation uses the Upmyalley inventory software that I have been using extensively the last two years at DEF Incorporated. My record of achievement with this system will be an asset for this company. Thanks again for considering me for the position. I look forward to hearing from you soon. Do you want to help someone you care about learn how to write sample thank you letters? If so then TELL A FRIEND below. I thank you for the opportunity to discuss the position of customer service clerk yesterday. Your interview with me highlighted what ABC Corporation required for the job. My strong customer service and office skills are ideally suited to your company. I am proficient in all Microsoft office packages and possess the experience you need. I really appreciated the tour of the facilities and the opportunity to meet Mr. Johnson the Production Manager. I can see why this company is at the top of the Fortune 500 list! I love the dedication to team work that ABC excels in. I am excited at the possibility of joining your team. Please feel free to contact me anytime for additional information. Please accept my thanks for the interview on November 7, xxxx at 10:00 am. Our discussion on the Payroll Technician position helped me understanding what the job requires and what the organization needs. I also appreciated the input from Yvonne and Jasmine concerning the learning curve. I have demonstrated in my employment with Every Company Corporation a talent for mastering and implementing new payroll software systems in a short amount of time. GreatJob Incorporated is using the MRS Payroll System which I have been supporting the last four years. This will enable me to adapt with minimal time and training to the your companies use of that system. I would like to make contact with you on Thursday of next week to inquire the status of the position. Thanks again for your time and attention. Many thanks for the interview on your recent recruiting visit to AnyCollege State yesterday. The Junior Accounting Trainee position sounds exciting and challenging. Abacus Accountant Firm looks to be an excellent match for my education and training. I will be graduating in June with a Bachelor’s degree in Accounting. In my educational pursuits I have mastered all the pre requisite accounting concepts which you company presently requires. I also have one year of experience using the new 123abc accounting software Abacus will soon be upgrading to. I sincerely desire to join the Abacus Accounting team and look forward to hearing from you soon. Please do not hesitate to call me if you need additional information on my qualifications. Thank you again for the opportunity to interview with Abacus Accountant Firm. These sample thank you letters contain the basic elements that should be used. Your interview thank letter should reflect your style, personality and the situation whether formal or informal. 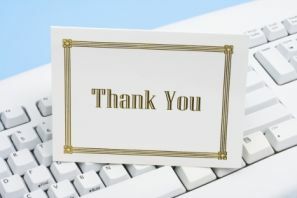 A growing number of employers accept email thank you letters as appropriate. If in the job interviewer uses that form of communication fine. 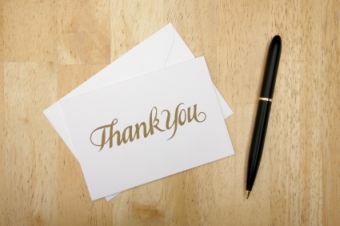 An informal thank you note can accomplish the same result as a thank you after an interview letter. Whatever form of post interview thank you used, keep it short, sweet, to the point and professional. You can find more great info on Your Basic Employee Rights by entering a search term in the Google search box below. To learn more follow this link to my interview thank you letters page.